Kampala World Cup Blast announces the metastases of Somalian Syndrome in the dictatorial capitals of the Horn of Africa.. It is very sad and condemnable to use civilian as a tragic target for such in human act, especially those sport fans of the World Cup. Today the Mogadishu syndrome is expanding in the Horn of Africa with highest rhythm than before. And the enemy of democracy could exploit any situation to mark its ruthlessness across the world. The world Cup that unites us in peace has been denounced in Mogadishu and blasted in Kampala!!! The Ugandan Capital is the new old target for the continues Somalian syndrome which is havocking the Horn of Africa. The main cause of the conflict in the Horn of Africa is the the perpetuation of the reign of dictators which become fertile ground for terrorist acts. There is no any democratically elected head of state or any democratic power transition in all of the seven countries in the region except that of unrecognized break away Somaliland. Somalia (Mogadishu), Ethiopia, Eritrea, Uganda, Sudan, Rwanda leaders came to power through arms way, either using liberation struggle or a mere coup d’etat. In the Horn of Africa the state power is forged under the barrel of the gun. These men in arm once in power they cling to it and continue to monger war in the region via Somalia. They play a sham democratic election to lulle the west. And they always win over 90% of the vote by ragging. Eash of the state helping AMISON the African union peace keeping mission in Somali are member states of IGAD and infested by internal unresolved conflicts. Somalia has been the Kurdistan of these dictatorial regimes. Since its colonial inception, the dream of “Great Somaliland” with five sided stares are pointing to the five different Somali populated regions in the Horn of Africa. Somalis like most of the post colonial African ethnic minorities are distributed through the post colonial frontiers of Ethiopia, Djibouti, Kenya. The rest Somalis are at war and divided into the break away Somaliland, Puntland and Mogadishu. The Somalian internal conflict helps to maintain the balkanization of the colonially divided regions like Kashmir and Kurdistan. It looks very far before the Great Somaliland come to reality. Rather the balkanization of Somalia and the rest of the Horn of African States will continue. Under the foot step of Eritrea, Southern Sudan will soon be the new state with that of Puntland and Somaliland on the agenda. The short term consequences of the Somalian syndrome would be the continual tragic Mogadishu type suicidal bastes making civilian victims in and around the region. In the middle term such syndrom would perpetuate the power of the armed dictators in the political scene. The worst would be the long term consequences which will result in the balkanization of the region to small ethical ungovernable auto proclaimed states. This is following the paradigm set by the Ethiopian ethno-genocidal Dictator Melese Ethnical states since 1991. The Horn of Africa has been a fertile ground for conflict and extremism since the fall of the Eastern block in 1991. This collapse brought the fall of the satellite regimes in Somalia and Ethiopia preceded by a military coup in Khartoum in 1989 where Ben Laden was the institutionalist . It was soon followed by the collapse of the Dictatorial Regime of Siad Bare in Mogadisho provocating the the fall of the Somalian State. This was further ignited by the comming in power of an irridetist rouge regime of Melese Zenawie in Addis Ababa, at the fall of the Communist regime of Mengistu Haile Mariam the same year. These dictatorial regimes use the Somalia as a proxy to their internal and regional post East-West conflict. The best demonstration would be that of Eritea and Ethiopian proxy war in Somalia. The more the Somalian exterime group create havoc, the more the power of these fallen states increaseas. The the regional dictators existance in power is directely proportional to the militarization and radicalized Somalia. The Somalian exterime ideology is also helping the other dictators of the region to use it to their Machiavellian political ends to disguise as peace makers and fighters of liberity and stability in the region. Today to prove your solidarity you have to send a solider to Somalia or Support the fallen regime in Mogadishu controlling only his residence. Such outright support is a ticket to western finical and diplomatic support to your own dictatorial military regime to perpetuate at the cost of the people of Somalia. The Somalian resistance to the creation of state is not a news phenomenon in pre and post colonial Africa. The Somalis speaking the same language and having the same religion are highly divided by a sphosticated clan based rivalry. Today the horn of African dictators use Somalia as a escape goat to cover up their internal undemocratic tyrancial regimes. 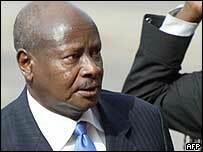 Uganda is mined with its long overdue internal conflict with the Lords Resistance Army (LRA), of Joseph Kony. The Ugandian strong man needs the Somali conflict to classify Kony’s Sudanese assisted movment under auspices of international terrorism. The unfinished Baganda revolution who gave the country its name has recently manifested to the international scenario at the recent unjustified burning of their respected King’s cemetery in Kampala. This cynical act has revived the most challenging long awaited but never delivered power transition by Yoweri Museveni’s regime. The Ugandan participation in AMISOM is just as Trojan horse for Melese Zenawi and pretext to perpetuate his grip on power home. Yoweri Museveni originated from Ankoli Bahima ethnic group which drives its tribal ancestry from the Merotic kings of Ethiopia. The Ankoli in power in Uganda are the same Ethnic configuration with that of the Tutis in Rwanda, Burundi and Bayamalenge in Congo. The Kampala world cup blast could be from one the internal factors attached by the majority population resisting the Bahima hegemony starching from Burundi to the highland of Ethiopia. Uganda & Burundi’s implication in the Somalia will have a far reaching consequences resulting in a serious of conflict that will engulf Mogadishu , Addis Ababa, Nirobi, Bujumbura and Asmara as continuation of internal ethnic and political crisis of the Eastern Africa beleaguered states . The de facto attribution of the worldcup blast in Kampala to Somalia war lords minimizing the internal factors of each canoutries political set up will be simplification and playing in the hands of dictatorial regimes in the region. The bomb is symbolically set to blast in the Ethiopian restaurant to show and protest the implication of the leaders of Uganda to the conflict in the horn of Africa . Burundi also needs Somalian cover up to fashion its long unsolved internal conflict whcih costs thousands of lifes since the Genocide of 1972. The country is undergoing post colonial internal Ethnic imbalance between the Tutis 15 % ( controlling the army originated from Ethiopia like the Ankole Of Uganda) and the majority Bawetu over 80% of the population. Burundi’s participating in Somalia is an internal balancing act of Tutsi controlled army by outreaching and supporting the minority regime of Ethiopia in Somalia and as a reenforcement to their minority power internally. Kenya has its northern federated region revendicated by Greater Somalia as one of its five corner stares. The incumbent president, Kibaki, is a member of Kenya’s largest and probably most powerful ethnic group, the Kikuyu, who total about 22 percent of the population; his rival, Odinga, is a member of the Luo, who comprise some 13 percent of the populace and live predominantly in western Kenya. In their bitter contest, in which Odinga promised to end ethnic favoritism and spread the country’s wealth more equitably, ethnicity was the deciding factor, and a marred victory on either side had always been likely to spark violence. The resent June 2010 Electoral and that of the 2008 bombing in Nairobi has its Somalian factor resourcing from the Somalian populated western region of Kenya. Kenya and Djibouti are inside the volcano of the Somalian syndrome as long as they are under the domino of minority dictatorial regimes like that of Ethiopia. In conclusion the Somlians are the Kurdistans of the Horn of Africa, every regime in the region uses Somalia to cover up their internal crime. The result is the expansion of the conflict in all of the region of 200 million inhabitants. In days to come the regime is condemned we will be seeing more crisis griping the region so long as minority dictators are in power. And more of refugees will be escaping these rouge and fallen states to save their lives. The international terrosort orgnaization have found a fertile ground cultivated and delivred by dictatorial regimes. In colnclusion more drastic blasts will be daily life in the diffrent capitlas of the horn of Africa as long as democraitationzion and power sharing is in political impasse. 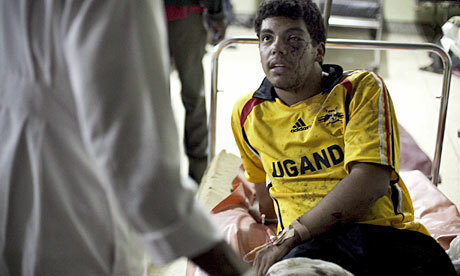 Uganda bombings: who was behind them? Uganda’s electoral board has published the question to be asked in next month’s referendum on whether multiparty politics should be restored. The electoral board said it had consulted closely with both sides of the debate before deciding on the question. Since President Yoweri Museveni came to power 19 years ago, Uganda has operated a unique political system which severely restricted political parties. Five years ago a similar referendum backed keeping the “movement” system. Last month, Uganda’s parliament voted overwhelmingly in favour of holding a referendum on the country returning to a full multi-party democracy. The motion was backed by all but 21 MPs and is being pushed for by Mr Museveni who says “it must go ahead”. The one-party movement system of government was introduced to try and prevent the chaos and ethnic conflicts that plagued Uganda throughout the 1970s and early 80s. At present political parties are allowed to exist but candidates for office must run as individuals – not representatives of a party. Some had argued that holding a referendum would be too expensive but Mr Museveni has said the people must decide. The Ugandan government and opposition parties all support a return to multi-party politics ahead of elections in a year’s time. Mr Museveni’s critics, however, fear that as the constitution is amended to bring in multiparty elections, it will also be altered to let the president seek a third term in office, from which he is currently barred. Like many people in Uganda, I went to bed at about 9pm on Sunday. I was not really following the World Cup, and I was tired after travelling across the city to visited a friend’s daughter at her boarding school. It had been a long, hot afternoon, and I was happy to get some rest. At about 1am I woke up and turned the radio on for company. I turned to the BBC World Service. First of all I picked up the result: Spain had won and the Dutch had not played well. Then I realised I was listening to the newsreader announce that there had been two bomb blasts in Kampala. My first reaction was a mixture of surprise and shock. Ugandans face many challenges, but their capital city has, for the past decade or so, felt like a safe, familiar place. The nightlife is open and easy-going. And the gentleness of central Kampala makes a sharp contrast with other African cities, such as Nairobi and Johannesburg, where hustling and theft is common. Terrorism, of the variety reported on the radio, was not really part of the landscape. What have people made of the bombings? Over the past day I have picked up a mixture of shock, but also a certain wariness about what the bombings mean. As is often the case, details emerged in sketchy fashion. At first the numbers were put at 13, then somewhere in the 20s. The local newsreader kept on commenting on the sadness of the events. By the time I left the house yesterday morning there were at least 64 confirmed deaths. Today, the number is 74. The venues targeted were the Kyadondo rugby club in Lugogo, an elegant venue that you pass as you head out of town on the Jinja Road, and the Ethiopian Village restaurant in Kabalaga. Both are popular spots for westerners living in Kampala. The wariness probably came from the need to be careful about what you say to a foreigner (particularly on something that might link up to national security questions). Many of the people I spoke to refused to offer a definitive statement on what had gone on, and instead focused on the very real human tragedy. As yesterday progressed, survivor’s tales, often in gothic detail, started to emerge in the Ugandan media. By contrast Uganda’s government was quick to assert culpability. Uganda’s inspector of police, general Kale Kayihura, told the New Vision newspaper that “these people” perpetrated the attack, meaning Somali Islamist movement al-Shabaab. 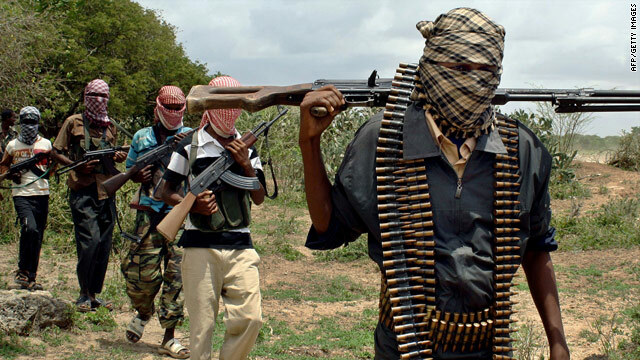 Al-Shabaab is strongly opposed to the presence of an African Union peacekeeping mission in Somalia (Amisom). Uganda has been by far the largest contributor to this peacekeeping mission. The Ugandan military has long been a recipient of support and technical advice from the US government. Thinking back to yesterday morning, I was struck by the fairly circumspect comments of the BBC’s east Africa correspondent, Will Ross. In fairly diplomatic language he pointed out that there is no proof of al-Shabaab involvement and that “the blasts could be linked to next year’s elections in Uganda”. Though this will get less play in the west, which mostly sees Africa through its own interests, Ross was referring to the instability of the domestic political scene in Uganda. Ethnic, regional and political antagonisms remain and they will shape next year’s elections. The current government is keen to ensure that President Museveni – in power for 24 years already – continues to serve as Uganda’s head of state. The nature of the violence – bombings, in a part of the city popular with westerners – has been the hallmark of Islamist violence in Africa and the Middle East. The violence is unlikely to be connected to domestic politics, though this will not silence the rumour-mongerers and conspiracy theorists that congregate around terrorist acts. What can be said is that Uganda is an increasingly nervous place. The elections give most people cause for concern. The alliance with the US is not without problems. An increasingly hardline version of Christianity may result in tensions with Uganda’s sizeable Muslim population (about 10%). There is also a fairly large Somali population in Kampala, which must now feel vulnerable. Terror Bombings in Uganda: A Prelude to Regional War? Sunday’s terror bombings, which murdered 76 people in Uganda’s capital, Kampala, are another signal that East Africa could face a devastating regional war. The attack demonstrates that Islamist terrorists willing to commit mass murder to advance their criminal theology remain active in eastern Africa. Americans first became aware of al-Qaida following the August 1998 terror bombings of U.S. embassies in Kenya and Tanzania. Somalia’s al-Qaida-affiliated Al Shabab Islamist terror group has claimed credit for the Kampala massacre. One bomb exploded in an Ethiopian cafe filled with World Cup soccer fans. Al Shabab’s murderers picked that target carefully. Ethiopia supports Al Shabab’s nationalist opponents in Somalia. Ugandan troops serve with the African Union peacekeeping force in Somalia, which makes Uganda a special target for Al Shabab. Al Shabab’s attacks in Kampala may be an attempt to repeat al-Qaida’s “Madrid Precedent.” Recall al-Qaida launched attacks in Madrid in March 2004, just before Spain’s national elections. A “pro-peace” government was elected, and it withdrew Spanish forces serving in Iraq. 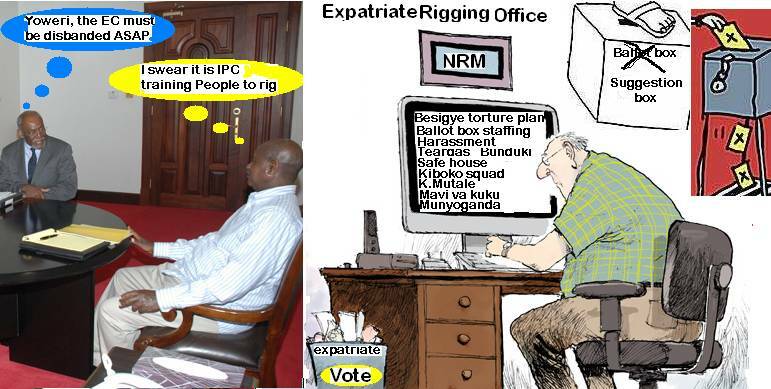 Uganda has national elections scheduled for early next year. Conditions exist for renewed civil war, and a nudge or two, a bomb here and assassination there, might ensure it. Al Shabab has studied the map. Should the Third Sudan Civil War erupt, Ethiopia would face war on a third front. Ethiopia already confronts Eritrea and Somalia. Radical Islamists would exploit the religious facets of renewed civil war: South Sudan is predominantly Christian and animist, and the north is predominantly Muslim. The Second Sudan Civil War lasted two decades, left 2 million dead, created millions of refugees and — despite ritual denials by Khartoum’s Islamists — involved slaving by northern-backed “Arab” militias. Southern Christian and animist black tribespeople were kidnapped then sold. Uganda was a covert ally of the southerners, for many reasons, including close links with the Dinka tribe, which provided the leaders in the south’s Sudan Peoples Liberation Army (SPLA). Arab slaving, however, played a role. Tribal violence already afflicts southern Sudan. Estimates vary (the areas involved are isolated), but a thousand people died in 2009 in tribal violence in South Sudan. The GOSS claims the north incites violence by providing arms to troublemakers. Sudan’s national president, Omar al-Bashir, is under indictment by the International Criminal Court for genocide in Darfur. Providing arms to willing killers is a proven Bashir policy. Oil fuels North-South disputes, and in a new civil war oil fields will be battlefields. Roughly 75 percent of Sudan’s oil reserves are in territory that GOSS claims. “Claims” is appropriate because the exact north-south border has not been finalized. The two governments argue over oil income. South Sudan relies on oil royalties for 95 percent of its budget. The north dispenses the revenues. The GOSS contends the north cheated it of $300 million it was due in 2009. Uganda insists Khartoum still supports Uganda’s Lord’s Resistance Army rebel group, so a new war could bring in Uganda as a military ally of the south. Kenya, and conceivably Ethiopia, might also be openly involved. Kenya has been a conduit for arms to the SPLA. In 2008, Somali pirates hijacked a ship transporting Ukrainian tanks to Kenya. The tanks’ destination was South Sudan. A vital environmental and economic conflict further exacerbates tensions. Kenya, Rwanda, Uganda, Tanzania and Ethiopia have announced they will no longer abide by a 1929 colonial treaty that gives the downriver nations what they regard as an unjust share of Nile water. The Khartoum government and Egypt reject the upriver nations’ contentions. Oil revenue and water rights disputes, religious differences, ethnic struggles and terrorists exploiting every division — East Africa’s fragile states edge toward a war of the poor that will create greater poverty.